Hamilton is up against Zeeland West tonight for its Homecoming game. So far in their season they’ve won 2 tournaments and took runner-up in a third tournament with a record of 25-4. Summer in West Michigan can offer many great opportunities to land trophy pike. 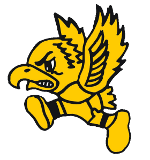 The Hawkeyes dominated the varsity boys tennis match against Jenison with a 6-2 win. The Hawkeyes aim to improve their performance at Regionals next week. For the 5th time in 6 years, the Hawkeyes grabbed the league title as they continue to dominate the conference. Hamilton coach Jeff Kolk was expecting a tough match and Hamilton came through big.